Would you like to know what the police are up to in your neighborhood? Whether you receive frequent communications from the San Francisco Police Department in the form of a newsletter, or nothing at all, depends entirely on where you live and who happens to be your local captain. Bayview residents, for example, get a weekly comprehensive newsletter emailed to them, but up until November, if you live in the Mission, you haven’t seen a newsletter since 2009. This, the SFPD promises, will soon change, thanks to a new template that will be used across the city and sent out monthly from each station. The required monthly newsletter is one of the reforms born from the Department of Justice’s recommendations. It is also part of a larger effort by Commander David Lazar, who heads the Community Engagement Division, to standardize and encourage community outreach across the city. Coming soon to you: a monthly newsletter, an active community police advisory board and a community liaison officer in each district. Some districts already have all three. But soon, these will be among the minimum engagement requirements for each station. In the meantime, newsletters, for one, are as diverse as the city’s neighborhoods, ranging from one to 21 pages. Distribution also varies greatly. Southern station used to send its newsletter to a Google group in 2010, while Tenderloin station posted its letter in the Fog City Journal in 2015. Taraval station has run a website since 2013 that updates every few days — with a lot of the same information you’d find in a newsletter — but only 100 or so people a day visit the website. Officer Benny Lew, who has been in charge of the Taraval station website for two years, understands that it is important to reach a wider group. At present, he said, many more people visit the website NextDoor.com and hear about crime second-hand. “[It’s] usually not quite the truth,” he said. The standard monthly newsletter will also force the command staff to remedy the computer glitches that captains can blame for lousy communications. Some are looking forward to the standardization. “That would make it easier,” said Capt. John Jaimerena, Northern station’s current captain. And it would compel the stations that send no newsletter — Ingleside, Tenderloin and Taraval — to do so. Mission and Northern stations only recently resumed a newsletter. The template for the promised standard newsletter includes a message from the captain, incidents of interest, officer and citizen of the month, community announcements, station and resource information, maps of various crime breakdowns and guides on how to report exemplary officers or make complaints. The only thing lacking in this lengthy 28-page sample would be something Northern station gets right. Its newsletter includes crime data on violent and nonviolent crime that compares current data to the same month last year. The year-over-year comparison avoids inevitable seasonal trends inherent in month-to-month comparisons. But, before the monthly newsletter becomes a reality, many distribution problems must be resolved. At present, Park and Richmond stations post their newsletters on NextDoor.com, which is only accessible if you’ve registered online. NextDoor, a private startup, also requires anyone who registers to live in that district. Central Station posts its newsletter on the station’s website, and the subscribe button takes a resident to a page with the newsletter in PDF format. Once there, the newsletter offers a lot of information — a mixture of light and useful news, maps where burglaries have taken place as well as other crime statistics, a profile of a local officer and upcoming meetings such as a meet and greet on December 7 at 850 Bryant St. with the investigation units. Only two stations — Bayview and Southern — currently send out regular newsletters to an e-mail list. Bayview Station is the star of the class, sending comprehensive weekly newsletters to its residents with such tidbits as a reassuring quote from Captain Steven Ford. “Currently, I am instituting a wide variety of plans and measures to mitigate the recent uptick in violence,” a recent newsletter quote from Ford reads. In addition to defining community policing and various crimes, the newsletter recounts such incidents as a recent homicide on the 1200 block of Quesada, where a 25-year-old male suffered multiple gunshot wounds. Officer Tepper of Bayview Station said she developed the curated content of the newsletter based on years of community feedback. Its easy-to-read format offers a quick and insightful snapshot. Tepper sends her newsletter out to 1,700 people on MailChimp, but that technology is overwhelming for many. Tepper has learned some tricks to get a reader’s attention, such as highlighting weapons used in crime reports in red — a simple format that catches the reader’s attention. She noted the lack of technical training that she and other police officers have, so it will be helpful if the format is simple. She said she would eventually like to add public service announcement videos in the newsletters. Lazar, who is working out the glitches, said that the department’s computer system has been challenging for anyone trying to do a newsletter. “We get a lot of complaints about the capacity, the ability to send these newsletters out. And there’s been problems with the technology on it … so we have work to do on that,” Lazar said. Tepper managed to find a workaround to solve the SFPD’s computer challenges: she switched from a WordPress site earlier this year to MailChimp. She sends the newsletter to Bayview recipients — for free. Although this could start costing if her subscriptions surpass 2,000, plans are underway to give each station $300 each month for community engagement. Even 5,000 subscribers would eat up only $60 of that. Lazar says he would like to see the monthly newsletter sent out via email as well as being posted on station websites. 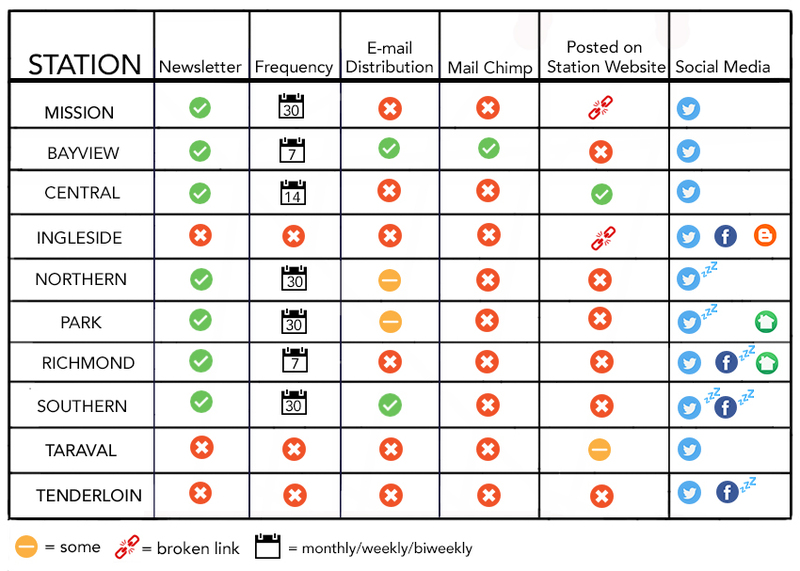 Nearly every station’s webpage has a link to sign up for the newsletter that auto-populates an email request for a subscription that is familiar to most internet users. However, the odds of actually receiving a newsletter are slim. In the course of reporting this article, only two of the links for a newsletter actually worked — Southern and Bayview. Some station’s links — the Mission’s, for example — lead to an inactive page. In Bayview, Officer Tepper will manually add subscribers to the list, or residents can sign up if a neighbor forwards the e-mail so the reader can subscribe directly through MailChimp. When people call Taraval station to ask about the newsletter, “We usually tell people we’re in the stage of implementing one,” said Officer Lew, although they haven’t had one for four years. Nevertheless, he said, he adds them to the recipient list for the new standardized newsletter that he knows is coming eventually. I get an email from the Ingleside Police Station every few days – the chart would have us believe they never communicate. They’ve been really good while a friend in NE SF hasn’t been able to get anything from the Northern Station. which we mention in the story and is included in the graphic. Officer Herb Najarro runs the blog. which is updated and can be another way for police to convey information that would be in a newsletter. At present, Ingleside doesn’t do a newsletter, but they are working on one.